George P. Johnson's Chief Strategy Officer, UK Jonathan McCallum spoke to Creative Breif about the importance of believing in big ideas, not the technology. As a teenager, film director James Cameron had the seed of an idea - a big idea. He made a pen drawing called Spring on Planet Flora, depicting an alien jungle landscape on a distant moon. Then, in 1974, in college, Cameron wrote a sci-fi short story called Chrysalis, about a cosmic journey of self-discovery by a wheelchair-bound man who finds himself in an alien landscape. The big idea was progressing. The big idea advanced further in the late 1970s. Cameron wrote a draft script, Xenogenesis, where characters encounter strange creatures on a planet, with a beautiful forest of interconnected, bioluminescent trees. The big idea was even more vivid. In 1980, he wrote a treatment for a film called ET. He discovered Spielberg was working on a film of the same name. So, Cameron changed his film title. While Cameron worked on epic projects like True Lies and the not insignificant Titanic, he continued to work on his big idea in the background. In 1994, he wrote an 80-page treatment for a planned release in 1999, two years after Titanic. But now that he had developed the full vision for his big idea he hit a problem. Cameron was told his big idea was impossible. The technology that was needed to realise his vision did not exist. His big idea went into development. His production team likened it to “building an airplane in flight”. Then, in 2009, the big idea was ready for the world. The stereoscopic filmmaking was revered as a breakthrough in cinematic technology. We were introduced to the mesmeric world of Avatar. Cameron’s big idea became the highest grossing film of all time. Over a year into my role at George P. Johnson, my view on the single most important thing for any agency, in any discipline, has not changed. It’s big ideas that drive success. It’s always about the work. All too often these days, agencies are led by technology, not ideas. And it’s the big idea that positively impacts our clients’ businesses. If you can take the brand out of the concept and it still works, then it‘s probably just a nice design idea, or a technology showcase. Not a big idea. The technology itself is just the means for delivering effective results. If Cameron’s story teaches us anything, it’s that we should always stay true to the big idea and find the means to deliver it. At the Mobile World Congress (MWC), AT&T wanted to showcase its network security portfolio capabilities to the specialist technology audience attending. But, the networking industry is highly competitive and everyone was saying the same thing at MWC: everyone is using emerging immersive technology to ‘tell a story’. Showcasing technology itself is not enough. We started with a big idea. Let’s move our client from talking about security, to the experience of feeling unsafe. What does it feel like to be inside an intangible network when your company is being hacked by rogue agents? Our solution was to put people ‘inside’ the network and demonstrate AT&T’s product solutions in action. Our best way to achieve this was by pushing the boundaries of fully branded B2B VR. 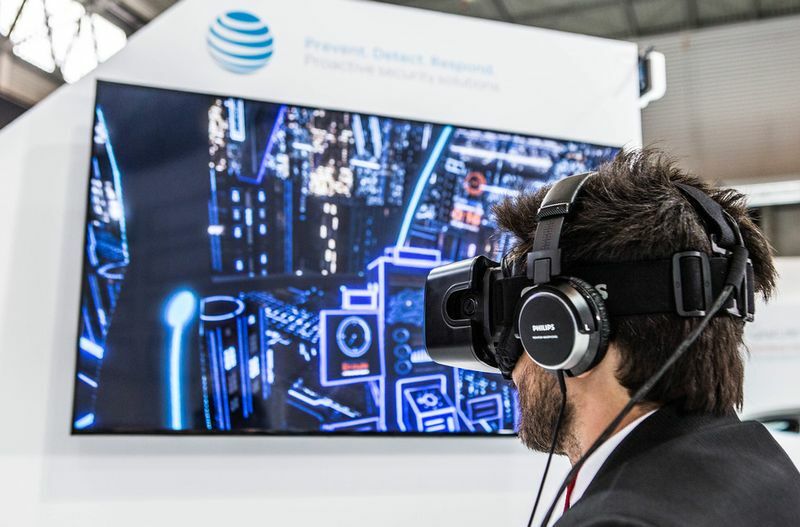 GPJ took advantage of recent advancements in VR technology and the release of the new Oculus Rift Headset to create a day in the life of a Cybersecurity Controller in an AT&T connected city. From strategic platform, through to bespoke build of the end-product, our aim was to create an interactive - not passive - experience. With the launch of Threat Intelligence, AT&T announced a new go-to-market platform combating a range of familiar network foes. GPJ brought this to life through a fully interactive VR game - Threat Defender. Once you’re familiar with AT&T’s portfolio in the training zone, you’re let loose to defend the AT&T network against DDoS attacks, malware and malicious WiFi. The solution was extended into a mobile app for iOS and Android and is now even available on the Oculus Rift store for all to engage in AT&T’s IoT story. We had a constant queue at MWC 2016 with over 3,500 people engaging and spending nearly 250 hours of time with the AT&T brand. The big idea which GPJ delivered continues to be overbooked across their annual event schedule. And we even made it onto the walls of the AT&T HQ in Dallas, with a bespoke render of the Threat Defender VR landscape.